Those of you who have been using Chrome a while, probably know that Chrome has some advanced settings that border on the experimental. These are referred to as Chrome flags. 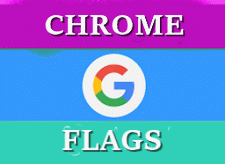 We found a couple of Chrome flags recently and found them to be very useful. One is great for saving memory, the other is great for generating passwords without installing any 3rd-party apps. Before we show you how to enable these two Chrome flags (experimental features), we will give you the customary warning. WARNING These experimental features may change, break, or disappear at any time. We make absolutely no guarantees about what may happen if you turn one of these experiments on, and your browser may even spontaneously combust. Jokes aside, your browser may delete all your data, or your security and privacy could be compromised in unexpected ways. Any experiments you enable will be enabled for all users of this browser. Please proceed with caution. Interested in cool new Chrome features? Try our beta channel at chrome.com/beta. So, you’ve been warned! We’ve tested the two flags we are featuring in this post — and we had no problems. However, this does not mean you won’t. So, proceed at your own risk. Do you often have 15 – 20 tabs open in Chrome at any given time? Does your Task Manager look like this? Every open tab in Chrome uses system resources. 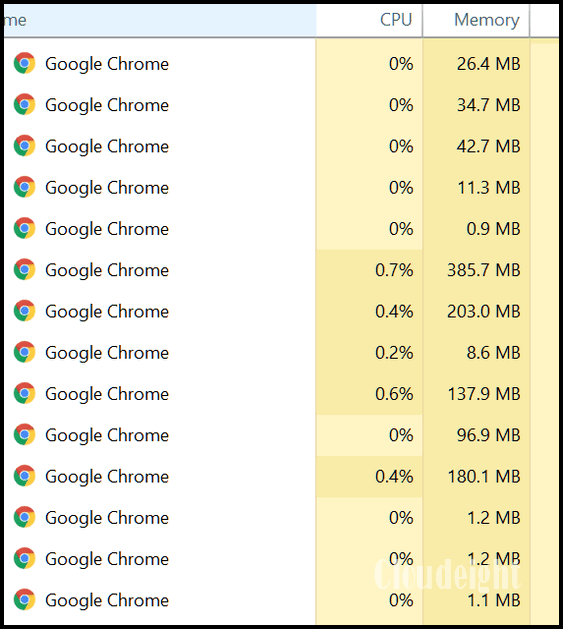 When you have a whole bunch of tabs open in Chrome, it can really slow down your PC – especially if you have 4 GB or less of RAM. Open Chrome. Type Chrome://flags in the omnibar (address bar) and press enter. Click the down arrow and select “Enabled”. You’ll see “Relaunch Chrome” button appear. If this is the only change you’re going to make, click the “Relaunch Chrome” button. 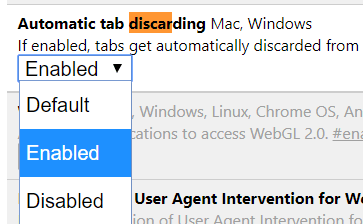 This will enable Automatic tab discarding. Tabs you’re not viewing will be put to sleep and will not be using system resources. If you decide you don’t like this setting, you can go back into Chrome://flags and disable it. If you want Chrome to automatically generate strong passwords for you when a sign-up page is detected, all you have to do is enable the Password generation flag. When you enable this flag, Chrome will generate a strong password for you, without any 3rd-party software or web sites. To enable Chrome’s password generation features, type chrome://flags/#enable-password-generation in Chrome’s omnibar (address bar) and press Enter. Or, if you choose, you can type Chrome://flags and press enter. In “flags” press Ctrl + F and search for “Password”. Enable Password generation by clicking the down arrow and select “Enabled” from the drop-down menu. Again, once you’ve selected “Enabled”, the “Relaunch Chrome” button will appear. You’ll need to relaunch Chrome in order for the Password generation feature to work. What are your thoughts about the national news release that Kaspersky is controlled by the Soviet Union? I don’t know much about it, and only use Emsisoft, but was wondering how you felt about it. With all the stuff going around about the USA and Russia, this is a hard topic to discuss without becoming mired in the current controversies. However, we’ve never been fans of Kaspersky, regardless of where it was developed or who owns it. If we’re going to judge software by who started the company, we’d need to mention McAfee too! However, we’ll just leave it at this – Emsisoft does a better job overall job than Kaspersky and the others. We trust our computers to it, our family members use it, and we’ve never had any reason to question its efficacy. And another big plus about Emsisoft is the support team and staff behind it. There’s hardly a week that goes by when someone doesn’t write us commending Emsisoft for going above and beyond to help them with a problem, even if it turns out it has nothing to do with Emsisoft. It’s hard to beat service like that. Our personal feelings aside, the fact that Kaspersky himself is a trained KGB agent, would be enough to make us think twice. There are many articles about this on cybersecurity sites and, of course, mainstream news sites. Here’s one that’s interesting: Congress Casts A Suspicious Eye On Russia’s Kaspersky Lab . Anything you see in flags for Chrome, Firefox and etc. you think is worth trying please mention.